Pelikan Edelstein Olivine Ink, 2018 Ink of the Year! Pelikan Edelstein Olivine Ink is Pelikan’s 2018 Pelikan Ink of the Year! This newest Edelstein ink is the 7th rendition of Pelikan’s “ink of the year”. Pelikan Edelstein Olivine ink, as well as several other ink of the year colors, are limited edition inks and thus will be available for one year. Edelstein, which means “noble stone” in German, are Pelikan’s higher end inks. All of these inks are rated with great lubrication, medium to high saturation, and are great performers. Remember once these inks are gone, they’re gone, as they are a limited edition. Pelikan Olivine ink is a deep dark green color. Olivine is actually a dark green crystal, and has nothing to do with olives, as one may expect. Pelikan Edelstein Olivine ink is much darker than Pelikan’s Edelstein Adventurine ink, and we would say is close to a hunter green. A very wet line will look almost green-black in color and may contain a hint of red sheen. Pelikan Edelstein Olivine ink looks great on the page. It has great characteristics that make it an everyday ink color for use at home or in the office. Continuing reading for a chance to win the bottle of Pelikan Edelstein Olivine ink we used for this review. We found the following characteristics while testing Pelikan Olivine ink, which you may find helpful. For this review we used French made Rhodia dot pad paper with a French made J. Herbin Glass Spiral Dip Pen. The dip pen is equivalent to a fine fountain pen nib. 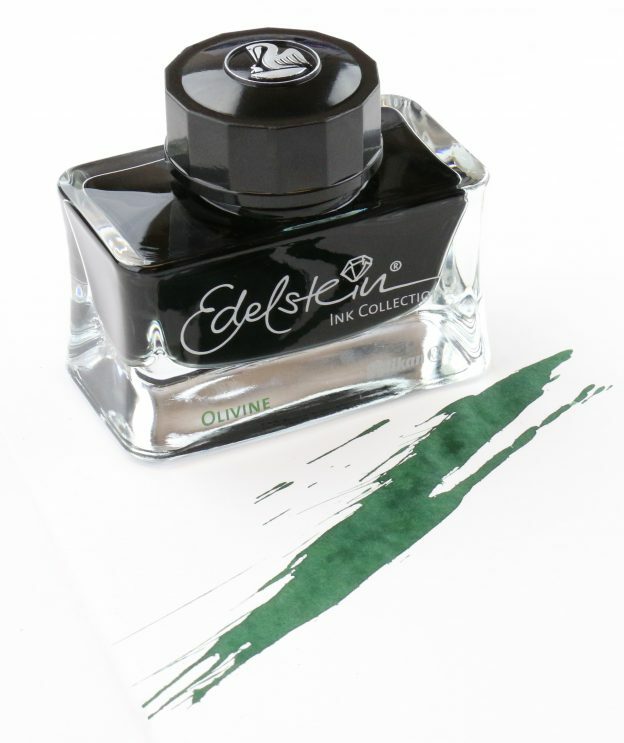 Pelikan Edelstein Olivine ink comes in the standard Edelstein ink bottle. The Edelstein bottle is a rectangular shaped bottle, with a wide, easy to use, faceted lid. The bottle has concaved sides, which makes for an interesting shape and look. The Pelikan Edelstein bottle, which contains 50 ml. of ink is one of the most visually appealing on the market. Pelikan Edelstein Olivine ink also comes in cartridges, and we offer it as well in 4ml sample vials. Pelikan Edelstein Olivine ink is considered a luxury ink since it is on the higher end of the price spectrum. It retails for $35.00 USD. However, we have it available for a reduced price of $28.00 USD per 50 ml. bottle, making it more affordable. We found a very quick dry time of approximately 5 seconds. Of course, your dry time will vary depending on the paper used, nib size used and the stroke of your pen (heavy or light). Regardless, Pelikan Edelstein Olivine ink seems to have a very reasonable dry time, making it usable as an everyday ink color. 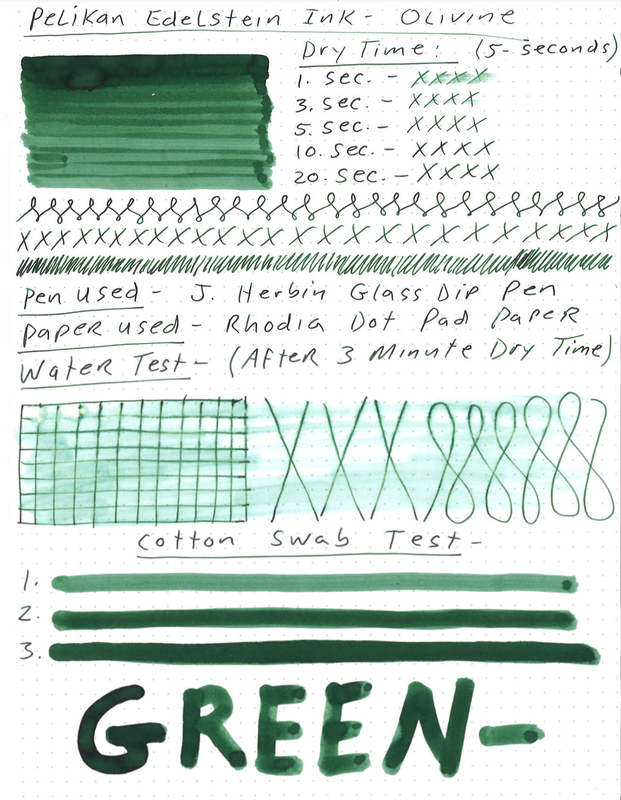 During our review of Pelikan Edelstein Olivine ink we found absolutely no bleeding whatsoever while using Rhodia paper. Even during the cotton swab test, where we placed a significant amount of ink on paper, there was no noticeable bleeding. Pelikan Edelstein Olivine ink produced very clean and crisp lines, with no feathering at all during normal use on Rhodia paper. During the water test we did experience some slight feathering. We ran a wet cotton swab over an ink sample of Pelikan Edelstein Olivine ink after it had dried for about 3 minutes. We found some color smearing and slight feathering. However, the lines remained legible and clear despite the smearing and feathering. Pelikan Edelstein Olivine ink is not a waterproof ink, but held up pretty well under the water test. Pelikan Edelstein Olivine ink can produce some very nice shading, depending on the users stroke and wetness of the nib. The wetter the line the darker the color. A dryer line can produce a light muted green color, where a wet line may produce an almost green-black. Pelikan Edelstein Olivine ink can also produce a red sheen with the wettest lines. Each of Pelikan’s ink of the year colors are “must haves”. Pelikan Edelstein Olivine ink is no exception. The dark rich color looks great, has great characteristics, and can produce some fantastic shading. Plus it comes in one of the best bottles on the market! Happy writing from Germany! This entry was posted in Fountain Pen Ink and tagged fountain pen ink, Giveaway, Pelikan, review on May 7, 2018 by Pen Chalet. Looks like a darker green that I would like. Thanks for the chance to win it! Looks like a great ink! This looks like a great ink! This looks like a green that I’d enjoy having. My favorite green ink is Iroshizuku Shin Ryu-Ko. This looks like a beautiful green. I’m curious and would love to try this out! This is beautiful ink. How about taking a manufacturer and do a couple of inks each week, then move on to another one. Just a thought. This is such a nice olive color. This ink looks gorgeous. I’m optimistic about its performance on absorbent paper. I’ve used Topaz and Ruby. These are great inks! Can’t wait to try this one. I love these inks, and their beautiful bottles certainly doesn’t hurt! I am interested in walnut and iron gall inks. I’d really like to see an in-depth review of all the sheen-y Organics Studio inks! This is a beautiful green! Guh! What a beautiful hue! I’m going to have to try this. This is such a fantastic color !! This is right up my alley. Dark and green. Looks like a good ink! Great detailed review. It’s a gorgeous green. Thanks for the giveaway! I’m a Pelikan ink fan and this Edelstein olivine is a gorgeous green. Actually not my colour range, but ‘d love to test that Pelikan Edelstein ink and a green tone. Would be glad if you could present suitable alternatives for LAMY’s Petrol ink. I have Aventurine. This would be another nice shade of green. My favorite ink is this ink, Olivine! This would be perfect as I’m always in the search for dark greens and not dark teals. Something like Noodler’s raven. Nice looking green, in one of the nicest looking bottles too! Favourite ink is Diamine Golden Honey. Monteverde’s Olivine is a different color. Maybe a comparison of the two inks. I know the Olivine group can range from brown and gray through various greens. Having an August birthday, I love the translucent Olivine known as Peridot (French for Olivine). Maybe the two inks next to some crystal Olivine or Peridot.. Neutral green inks have steadily grown on me more and more with time. Thanks for the review and give away! I would like to see reviews of some permanent inks. I need to learn more about them. It would be great to see a comparison between Pelikan Edelstein Olivine and any inks that are close to it in color (perhaps one of the Monteverdes, or Montblanc Irish Green, or …). Also, a comparison between Edelstein Olivine and the other Pelikan green inks (Edelstein Aventurine, 4001 Brilliant Green, 4001 Dark Green) would be nice. Thanks! The Edelstein inks are such gorgeous well behaving inks! Amethyst was my favorite, but this one looks beautiful too. I’ve been looking for a pen to complement my Racing Green Lamy Studio and this ink is a great match! I’d love to get a bottle. I’d love to see some grey ink reviews. Thanks! That is a beautiful green. Is there supposed to be a matching pen this year? I have never tried an Edelstsein ink and I’ve never used a dark green in any of my pens!! Thanks for the chance to win it. I’m not into this one. It looks nice but doesn’t write well at all. Did you only test it with a glass pen? That wasn’t clear from the review. Thanks!